It’s no accident that Bravely Default’s Japanese subtitle, Flying Fairy, is shortened to FF; the game is essentially an outsourced Final Fantasy, published by Square Enix in Japan and developed by Silicon Studio. There’s nothing ground-breaking within the gameplay; the ancient formula of turn-based battles form the basis for some new mechanics that feel a bit pointless: The Brave and Default system from which the game derives its name is a convoluted Guard with little effect on the gameplay besides drawing it out a little longer. Fortunately you can completely ignore the social features and micro-transactions. Status effects play a huge part in gameplay with at least one popping up in the majority of battles. This detracts from the enjoyment of the game as it frustrates rather than challenges the player: Preparing for a boss that utilizes poison only to get tangled up with a monster that spams silence – which you now have no way to deal with – is no fun at all. Combined with the uninspired level design – walk from one door to another – the buffer between plot points becomes a rather detestable slog to get through, an issue exacerbated by a plodding pace that becomes torturous in the second half of the game. Many design elements add to this, the dull and lengthy animations even in fast-forward mode chief among them. The infuriating decision that any attacks to a now-dead enemy are split between the remaining enemies instead of spent to kill one is a big detractor, too. 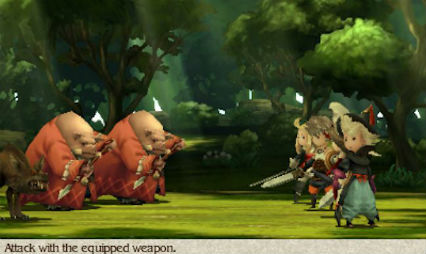 Bravely Default features a robust job system, allowing players to choose different roles for each party member and customise it – mixing the class with abilities from others. This adds depth, challenging players to tinker to find the most efficient combinations to tackle each encounter. Many bosses of the game are frustrating by design; they’ll suddenly start using new mechanics with no warning, one of them using a vaguely named ability that reflects your opening salvo to kill you in one shot. It’s a shame that this can be so dissuading as there are later bosses with mechanics that are incredibly satisfying to think your way through. 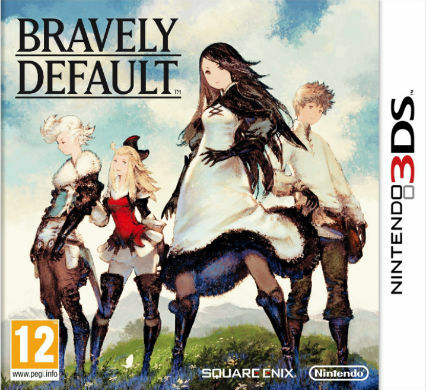 Bravely Default features a typical Japanese RPG story: The world is threatened by some mysterious entity and it falls to a group of teenagers to restore the peace. The cliché twists show up, unfortunately riddled with plot-holes, but they’re nothing new or noteworthy. The developers also saw fit to alter the title screen after a certain plot point in a brash display of egotism – an undeserved pat on the back for a predictable and lazy twist delivered with the subtlety of a freight train. The four protagonists are endearing with their prominent defining traits – the relentless will to see righteousness that pours from Edea, the reserved but fierce passion of Agnes, or the comic perversions of Ringabel. The naïve Tiz is less enthralling, bearing little more than a childish bewilderment that makes him more of an avatar than a character. The eclectic cast of minor characters are equally fascinating, the veracity of each of their personalities making up for their lack of dimensions. Seeing the interactions between them is also a joy, each of them written to draw on the strengths of each other in heart-warming or amusing ways that feel incredibly human. It’s a shame then that their models get in the way of this. While they are vibrant and go some way in accenting some of the minor characters’ identities, the limited faces and lacking animations are inimical to any form of expression. The voice acting is also terrible and incohesive though it can be changed for the original Japanese audio, the impassioned delivery transcending any language barrier. This really does a disservice to some scenes in the game such as an early speech from Agnes. While the writing and Japanese voice acting were excellent, the visual delivery just fell flat. With a better model or an FMV, a merely sad scene could have been heartbreaking. The best and most unusual plot point is D’s Journal, a prophetic diary in the possession of amnesiac Ringabel that bleeds intrigue. It’s a great element for those who enjoy more story and character-based puzzles, even if it concludes predictably. 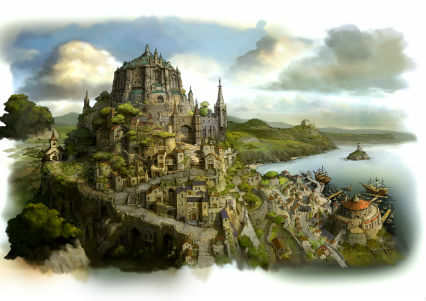 The art of Bravely Default is wonderful, its world nestled between storybook and comic book, imaginative takes on classic ideas peppering the stunning backdrops. Each town and dungeon is a character in itself, telling stories of tragic beauty or tarnished glory without a word of it ever being uttered. The Lovecraftian summons continue these themes, one example being a giant beast who is described as dwelling within the town’s street lamps. This nightmare mix of familiar and alien gives a strong identity to something that could have easily been as lazily handled as the plot. The second half of the game is unforgivable. Tiz and friends are forced to go back through multiple dungeons and fight through all four of the chapters’ bosses again. Multiple times. No amount of beautiful scenery can redeem this infuriatingly repetitive mess. This creates hours of forced grinding due to the increasing difficulty of the bosses coupled with the lack of new areas to fight through. The best part of the game is also completely removed: There are no new areas and thus no new artwork to see. The once loveable characters take a hit, witty and heartfelt banter replaced by illogical and inconsistent dialogue that makes them all look like idiots for going along with the predictable antagonist’s tripe. Bravely Default would have gone far as a comic on the merits of its artwork and characters. For a game that plays with the themes of new technology enhancing that of old, it feels stale and derivative both mechanically and narratively while putting the worst elements of the genre on a pedestal.